We’re excited to be able to announce that the gala is going ahead! We’re raising funds for St. Mungo’s —- a charity working with homeless people, supporting them and helping end homelessness and rebuild lives. 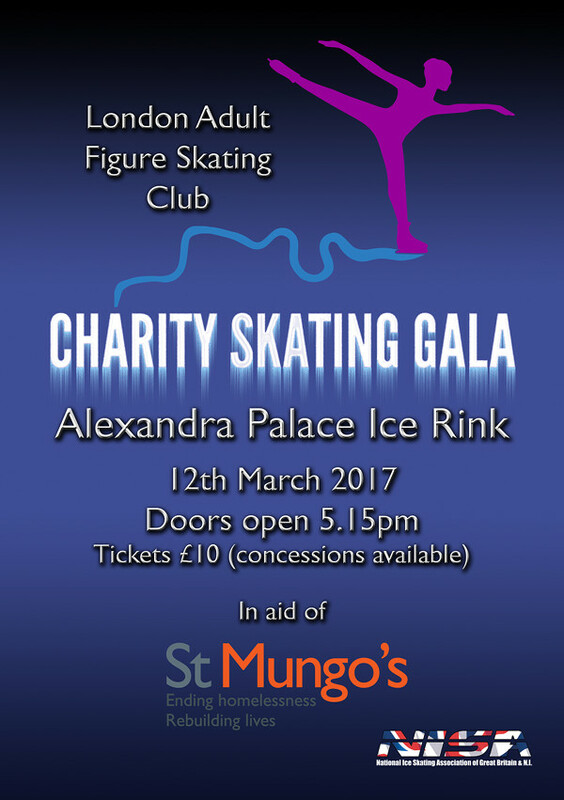 The gala will take places at Alexandra Palace ice rink on 12th March, with doors open from 5:15pm. You can buy tickets in advance here (£10 full price, £5 children under 15 (must be accompanied by a non-performing adult) and £7.50 for concessions). You can also see our gala-specific pages here, which include a bit more detail about St Mungo’s and also some photos of previous performances by our members. If you’re one of our members and would like to take part, you should have already received an email about how to sign up, but if you missed that then do have a look at the club’s Facebook page for more details. Please do join us if you can, to help support St. Mungo’s work!